Food is such a friendly topic that it’s often thought of as a “hook” for engaging visitors – a familiar way into other topics, or a sensory element to round out a living history interpretation. But it’s a topic all its own, with its own history and uncertain future, deserving of a central place in historic interpretation. With audiences more interested in food than ever before, and new research in food studies bringing interdisciplinary approaches to this complicated but compelling subject, museums and historic sites have an opportunity to draw new audiences and infuse new meaning into their food presentations. 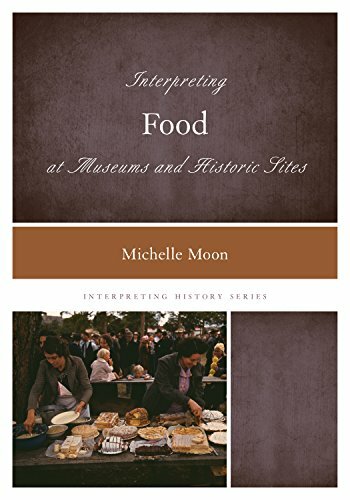 Interpreting Food at Museums and Historic Sites offers a framework for understanding the big ideas in food history, suggesting best practices for linking objects, exhibits and demonstrations with the larger story of change in food production and consumption over the past two centuries – a story in which your visitors can see themselves, and explore their own relationships to food. To purchase, visit the Rowman & Littlefield website, Powell's, or Amazon. Rowman & Littlefield are offering a 20% discount with code 4F16INTHS until May 2017. And through September 2016 only, they're offering 35% off all orders with code 16SUMSALE. Farm-to-table dining, community gardening, local menu sourcing – the food movement has taken off. But is there something missing? Stanton and Moon argue that public history has an important role to play in efforts to reshape the the industrialized food system. This practical guide includes primers on agricultural history and policy, points the way to useful sources for interpreting the history of food movements, and offers a road map for embedding deeper perspectives on changing food systems into historical interpretation. "Why Greenfield's Kitchen Mattered," Roanoke Times, March 20, 2016 [originally published as "The Kitchen is the Heart of the Home: Why Greenfield's Slave Cabins Matter" on AASLH Member Voices, January 16, 2016]. "The First Course: A Case for Locating Public History within 'The Food Movement'," Michelle Moon and Cathy Stanton, The Public Historian 36.3, August 2014.
Review: The American Plate: A Culinary History in 100 Bites, Libby O'Connell, AASLH History News, Winter 2016. Contributor: "Slowing Down to Focus on the Art," Center for the Future of Museums, March 31, 2015. "Morgan38: A Modern Maritime Adventure," Exposure, July 12, 2014. "Do We Docent?" Connected, April 8, 2014. "A Breath of Fresh Air," Connected, February 20, 2014. "Back to School," Connected, August 26, 2013. "Silly Rabbit! Museums Aren't [Just] For Kids," AASLH Inkwell, October 11, 2012. "All Fun and Games," AASLH Inkwell, October 19, 2012.